View cart “Preggi Bellies – The Next Generation DVD” has been added to your cart. 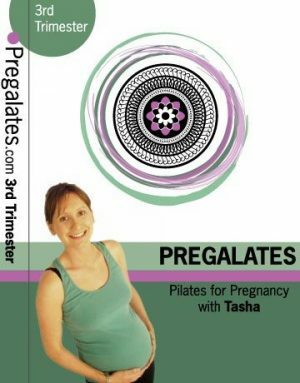 The Pregalates 3rd Trimester Pilates DVD caters to a woman’s needs during this pregnancy stage. Presented by Tasha Lawton. The pregalates pilates for pregnancy DVDs are unique. Firstly, each workout is trimester specific and secondly, Tasha, your instructor is pregnant too, so she’ll be going through it with you (in more ways than one). Each workout lasts between 45 and 60 minutes and targets all areas of your body. Beginning with a gentle warm up, leading into the tummy to work on your balance and flexibility, before moving onto your side (lateral) muscles, followed by your legs, arms and bum. Although each trimester is different, in essence the exercises are the same, which allows for a more thorough understanding of the movements. But there are crucial adjustments that are specific to each stage of your pregnancy. For example, the time spent on your back for the second and third trimester is greatly reduced. The pace of the exercises will also mirror the change in your energy levels and the range of movement alters to take into consideration the amount of relaxin that’s present in your body. 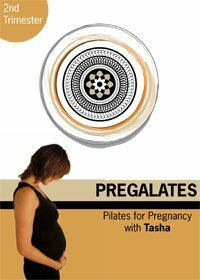 There are four professional Pilates for pregnancy DVDs, which cover the 1st, 2nd, 3rd trimesters and the post-natal stage. You can buy them individually, or as a complete set. And because the DVDs are split into different trimesters, they can be started at anytime throughout the pregnancy.